Climb the ladder to achieve one-putts by choosing the right putter, achieving an immaculate set up, reading the greens, acquiring touch and feel and honing your skills through drills. This book also includes some stunning bespoke photography from Getty's No.1 golf photographer as well as many shots of today's leading Pros shot especially for the book. With Ken's own analysis and stories from a wealth of experience, this heavily illustrated, easy-to-follow book will make honing this golfing skill easy and entertaining. This is the young man most British Pros would choose to have putting for them. But it's not just natural talent that makes this lanky, young player so good; he putts and chips for three hours every day. Ken made an immediate impact on the tour in 1976 with his lethal short game, soon gaining the nickname "One Putt". His putting method was closely examined by all and sundry, including myself. From 6ft 2ins he would origami himself down into a rock solid stance, the only moving part appeared to be the head of his old hickory shafted putter. My practice times with Ken made me a better putter. I still work on his words of wisdom 40 years later and can clearly remember his bemused expression watching someone putt with so many moving parts. Over the years Ken Brown's advice has always came with authority and simplicity. On the putting green at Royal St. Georges before the first round of the Open he reminded me "let your attitude determine your golf, don't let your golf determine your attitude." My name ended up on the Claret Jug. From novice to aspiring major winner, I believe One Putt will work for you. 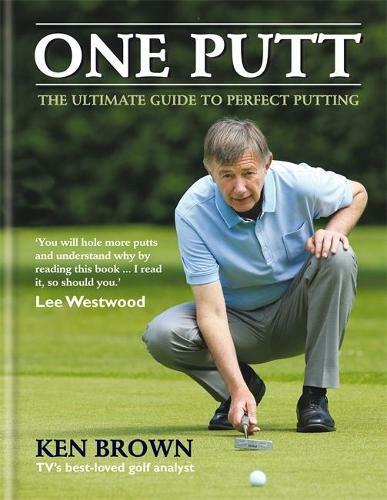 You will hole more putts and understand why by reading this book. Ken takes you step by step up the putting ladder with a simple and easy-to-follow guide, revealing all you need to One Putt. I read it, so should you. I can hardly remember my own journey in golf without Ken Brown. He and I grew up playing Herts Boys' Colts and Herts County teams together through the summers of '74 and '75. He had two hallmarks; his stance and his old hickory relic putter. He had an instantly recognizable popping stroke which made that old thing work masterfully again and again. He has an easy going and affable style; a friend to golf and golfers on all levels and he shares his gift for putting and place in this game here. Thanks, Ken for your friendship and the secrets shared with this book.